WhatsApp beta for Android 2.18.83 and 2.18.84: what’s new? WhatsApp has submitted two new updates through the Google Play Beta Program, bringing the final beta version up to 2.18.84. • The locked voice recording feature is not available yet. WhatsApp is started to work on this feature in the 2.18.70 update, but the developers are keeping it disabled for development reasons and it will be enabled in next releases. So it’s okay if you have updated your WhatsApp version and you don’t see it, but probably it will be available very soon, also if we don’t precisely know the day. 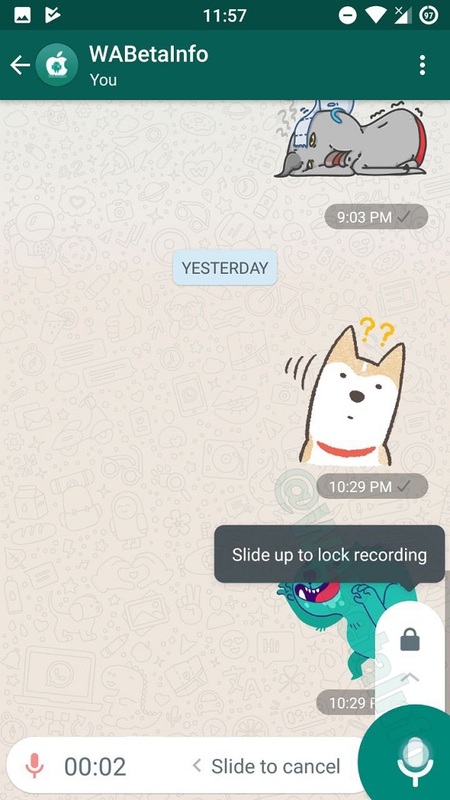 • The sticker feature is not available yet because it needs more development. • NO RELEASE DATE AVAILABLE FOR BOTH FEATURES. WhatsApp has updated the UI of the tooltip, to prepare the build to get the new Locked recordings feature. New tooltip UI. Already enabled by default. After introducing the Locked recordings feature in the 2.18.70 update (and we remember it is not available yet), WhatsApp is improving it in the 2.18.84 update, before releasing it for everyone. WhatsApp has currently implemented a very nice tooltip in order to explain to the user how the feature works. It has the same UI of the tooltip above mentioned. The 2.18.83 update brings minor bug fixes about emojis and the group description feature. The user was able to call himself tapping on the bubble “You deleted this description”. This strange behavior has been correctly fixed in the update. Next PostNext WhatsApp is working to develop a compatible app for a new platform: KaiOS!